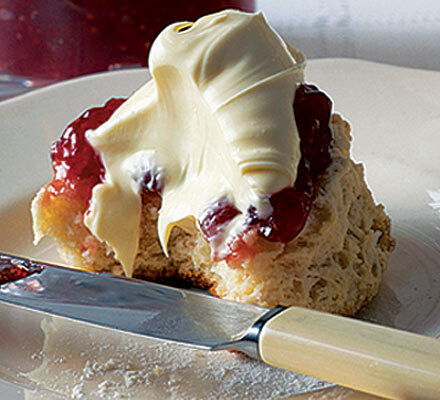 Is there anything more appealing than a freshly-made scone spread thickly with jam and cream*? Once again then, friends, we find ourselves at Flash Fiction Friday. There are quite a few other flash fiction blogs out there and words counts vary – anything from 20 words (or the Twitter 140 characters) up to 1,000. In my book, 1,000 words counts as a short story, but I have also noted that Prima looks for 800-word stories every month for its magazine. And you can win £100. Worth trying, hmm? Anita looked at what he’d done. Covering the kitchen table were beautifully decorated cupcakes, slices of malt loaf, treacle scones and an elaborately iced, three-tier fruit cake. Her mouth watered. Where to start? Should she try scones, fresh from the oven and thickly buttered? Or should she slice into fruit cake and cram her mouth with dried fruit, marzipan and sugar paste? *Photo taken from the BBC Good Food website. The recipe for this scone is here.